Giant kelp forests are a temperate water divers heaven. They provide shelter through their towering, dense canopies and consequently, a much greater diversity of plant and animal species is found in kelp ecosystems than almost any other ocean community. Almost gravity defying, giant kelp is the largest marine plant in the world. The algae grows up to 45 metres tall from a small holdfast and is held up by small, air filled bladders. There are only a few places in the world where divers can get to experience these magnificent ecosystems, Tasmania being one of these very special places. The giant kelp forests along Tasmania’s east coast were once so dense they featured on shipping maps. But it is a little known fact that in Tasmania times are changing, and changing at a very rapid rate of knots. According to research conducted by The Institute For Marine & Antarctic Studies (“IMAS”) there has been up to a 95% decline in Tasmania’s east coast giant kelp since the 1940′s. The disappearance has accelerated in recents times as witnessed by divers and dive operators. So what is causing the demise? The simple answer is warming ocean temperatures. Giant kelp thrives in cold, nutrient rich water and, in ideal conditions, can grow in excess of 50 cm per day. But the east coast of Tasmania is proving to be a hotspot for climate change. Ocean temperatures in this part of the world have increased by an average of 2.5°C since the 1940′s. This unprecedented increase is several times greater than the global average increase in that period. So why is such a rapid climate change occurring on Tasmania’s east coast? Any fans of the movie Finding Nemo will know about the East Australian Current (the “EAC”). It was the EAC that brought Nemo down from the Great Barrier Reef to Sydney. Essentially, the EAC intensity is increasing and as a result, warmer, more nutrient poor waters are arriving in Tasmania. The warmer, nutrient poor waters create sub optimal conditions for giant kelp growth. Add to this, the arrival of non-native local species (of which more than 40 have been identified as being brought down with the warmer waters of the intensifying EAC) and the ecosytem is starting to strain. Of these non-native species, perhaps the one that is having the most significant impact is the long spined sea urchin. This urchin is a voracious eater and is stripping the east coasts sea beds of life, creating barren landscapes, void of sponges, algae and life. Whilst plans are underway to combat sea urchin spread, there is little hope for the giant kelp. Whilst the giant kelp forests of Tasmania’s east coast have now been listed by the Federal Government as an “endangered ecological community”, the listing offers no real help for the kelp whose demise is largely due to temperature and nutrients. The quest now for IMAS and other scientists is to learn what we can about the demise, whilst we can. It is an unfortunate example of how small changes can have a massive impact on the balance of our complex ecosystems. In order to highlight the plight of Tasmania’s giant kelp forests, friend of DiveBuzz, Rebecca Ramaley has recently launched a short video to capture her first hand experience of the disappearing kelp. In 2011, Rebecca dived and captured the superb kelp forests of Fortescue Bay on the Tasman Peninsula. A year later, she returned and the forest was gone. Destroyed by storms, this rapid growing forest had simply failed to regenerate due to the sub optimal conditions. We hope this short video captures your imagination. Whilst disturbing, it is a great example of how we as divers can capture the impacts of climate change and, in doing so, help to drive awareness and change. Rebecca wants this video to be a tribute to the beauty of these forests. We thank Rebecca for allowing us to share this dramatic story. 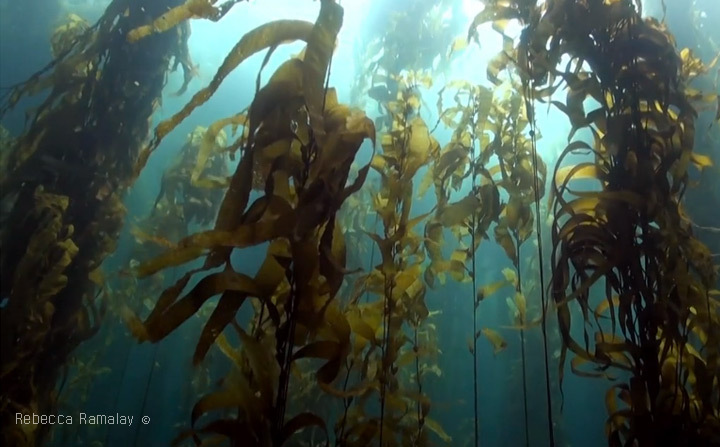 Tasmania’s disappearing giant kelp forests from Rebecca Ramaley on Vimeo. The British Museum Press is working on an exhibition catalogue entitled indigenous Australia. The exhibition will open its doors in the British Museum in April 2015. We would be interested in publishing this beautiful image by Rebecca Ramalay inside the book. I would be grateful if you could put me in touch so that we can discuss the project and conditions.